Ok - so this is the second to the last day of 2012! 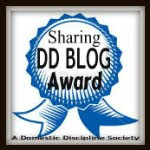 As I wrote in my last blog - we use Domestic Discipline to help us communicate better, to work out our problems on the spot (hopefully) and build a deeper understanding of the new roles we want in our relationship. But today I had an idea! DD can be used for so many wonderful things. One of my major goals is to be a submissive wife - but another goal is to be a better person. I work in the day and have to get up early a few times a week, which is a big problem for me, because I am a night-owl. I love going to bed late - which means I'm a wreck in the mornings. I asked Daddy Jack if he would help with by giving me bedtime curfews. I meet later in the morning - he'll let me stay up a bit longer. I can't do this on my own -I need Daddy Jack to help me achieve my goals. So for the next year, he'll tell me when to go to bed - no negotiating - no contradictions. If he feels like sending me extra early to bed - I have to obey, because it is his right as leader of the house to send me to bed whenever he feels like it. This second part is to help me learn obedience which is essential for being a good submissive and taken- in- hand wife. So, that¨s what's new around here - and I am so happy to have a HoH who cares so much about me, that he will anything he can to help me reach my goals! How lucky am I?!! I hope 2013 brings you all the happiness you can handle! Happy Happy New Year to both of you! See you next year - for sure! Thank you so much for all your wonderful words of advice. Looking forward to reading more from your hand. Mine is more than happy to help me enforce my own rules, too! I almost think that's easier than him making them up, lol :) I love it!